Last weekend was the 3rd Annual Scott Kelby Worldwide Photo Walk. Photographers of all skilled level from all over the world gathered into their local groups to socialize and take photos. Our group traipsed through the charming downtown & residential area of Los Gatos, CA and I came across this window display. If you took part in this photo walk in your area, I would be interested in hearing about your experience. Karen, that is just so charming. 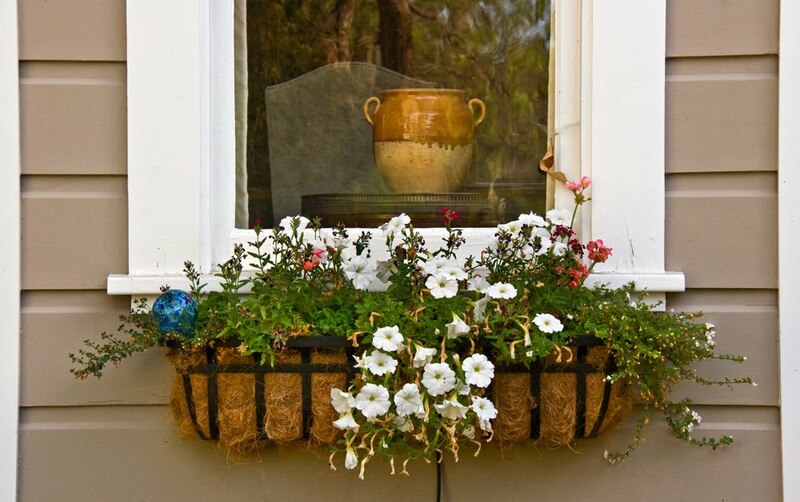 I am always attracted to flower window baskets. Very quaint. Sorry I didn't know anything about the walk. The Fair opened earlier because of attendance being so low. Our schools open Aug. 8 through the 18. They found attendance was far improved this time. All the food vendors outside the midway had to drop their prices 25% too. Seems to have helped. The sky was really that puffy. Its just showing through the thin sunshade. I love the angles and kind of abstract look of pointing the camera straight up. I would like to take my photos quietly. Love this shot, so inviting. Hope you had a great time! Looking forward to seeing more. Photowannabe: Thanks for the explanation about the fair schedule. Wished I could've attended this year. Rainfield61: I don't know, I think your photos speak very loudly. Lina: It's always interesting how people want to decorate their homes. Betchai: It's fun to go on photo outings in a group, but you have more freedom going it alone. the window display looks eye catching indeed.